Written by Dr. Hemang Sudhakarbhai Jani and medically reviewed by iCliniq medical review team. Meditation is a state of the mind where you just have to learn to be relaxed and sit still. Often, people think meditation is about concentrating on a particular object or thought. But it is not so. Meditation is an activity where you try to slow down the frequency of thoughts and gradually stop thinking about anything from the past or future and focus only on the present. Initially, when you start practicing meditation, your mind moves forward and backward like the pendulum of a clock. As you practice more and more, your mind will become still and for a moment reach the point of highest awareness, that is samadhi, the peak state of dhyana. Please suggest yoga asanas that would improve blood flow to testicles. Meditation is the state which makes the body calm, and the mind relaxed. It does to the mind what sports does to the body. It gives you the immense energy of Prana (breath). Being in 20 minutes of deep meditative state will provide you with energy equivalent to four hours of sleep. The working capacity of the individual can be increased. Some people think that if there are too many thoughts, then the meditation was not fruitful. That is just a myth. In fact, there are two types of meditations, one with thoughts and the other without any. So, experts say thoughts are alright. It will take a little practice to turn the thoughts from negative to positive. If you frequently feel bored, restless, or negative vibes surrounding you, you can make it a habit to practice meditation for 20 minutes every day. Even if relaxation is not your purpose for meditating, still it is an indirect result of it. Apart from this, there are various other health benefits which researchers are studying to be the result of long-term meditation habit. Eases other mental health conditions. An overall sense of wellbeing. Although various benefits are listed, the goal of meditation is not to have any objective or expectations of the outcome. Just allow yourself to be in the present and calm down emotionally. Select a calm and peaceful spot at home or work where there is least distraction. Choose an optimal time, preferably early morning, and stick to the same timings every day. Close your eyes and breathe naturally. Do not try to pull the attention to any point or breath. Just be natural and leave your body still and free. Meditation is not about concentration. It is the generation of concentration (focus). Do not force yourself to pay attention to a single point. Just allow your mind to go where ever it wants to. Start with a single two to three-minute session a day and slowly try to increase it for more extended periods. We often give ourselves excuses like 'I do not know how to do it,' 'I do not have the time for it,' etc. But, in reality, investing a few minutes every day for this activity gives us more time by making us more focused and productive. So, let us resolve to start each day on a positive note. 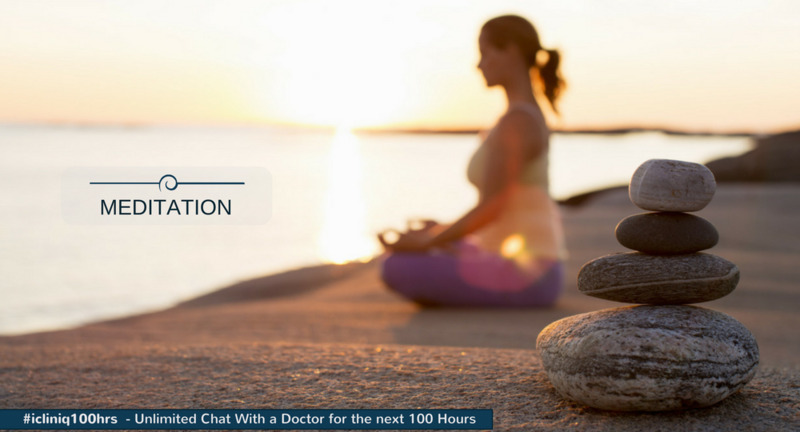 Do you have a question on Meditation or Yoga?